Essie's 1000th shade - Aim To Misbehave. 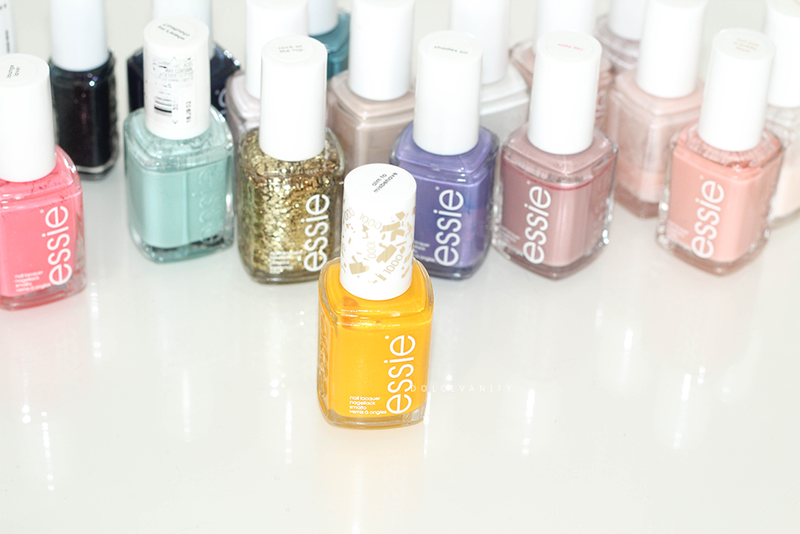 999 essie nail polish have been created, sold and loved by nail polish lovers. So what does the 1000th shade by essie look like? Well it looks like this, a golden yellow hue with shimmer running through it. I remember reading an interview by Essie Weingarten, the creator on yellow "...the final decision is mine. For example, everyone says I’m the 'no-yellow girl' because everyone in the world was doing yellow this season and I wouldn’t do yellow. It really doesn’t sell. And they were like, ‘No, no, no, we have to do yellow!’ I said, ‘Well, let the other companies do yellow.’ At the end of the day, it’s a great accent color, but to wear yellow, it’s very difficult. So all these companies did yellow and if you go into the stores, you see yellow still sitting on the shelves." 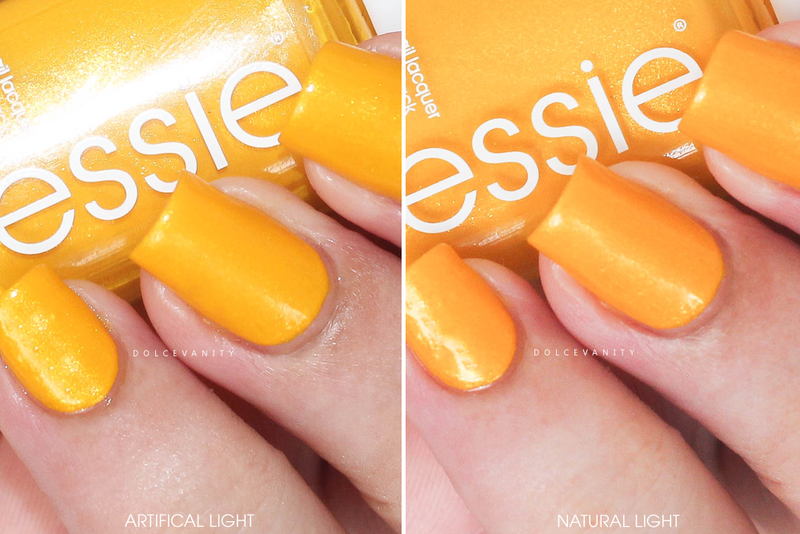 So it's nice to see some yellow even if it's limited edition as I'm sure essie have done LE yellow's before? This is part of the Rio 2016 collection and like the collection this is limited edition. Now I don’t mind branching out with my nail colours, sometimes besides my makeup it’s the only bright thing on me. While I keep my pedicure to neutrals or whites only, I never mind with my fingers too much. So I decided let’s see how much I love Aim to Misbehave when it’s dried. Did the 1000th essie polish deliver? As always the formula for me is flawless, I applied 3 coats to make sure there was even coverage, when I had only two coats I could still see a sheer colour line near the cuticle but 3 coats fixed it. I liked this warm yellow/golden hue, it's different for me but I still have enjoyed wearing it. It's eye catching, even as I'm typing this and the little bit of sun coming through the window is allowing this to shimmer ever so delicately. What do you think of Aim To Misbehave? What a gorgeous colour! My daughter would love that shade to add to her collection. Wow I can't believe Essie have released their 1000th shade - I wonder how they come up with the names for all of those colours! I know, I always think of that. I could only imagine their brainstorming meetings! I seem to always draw towards essie, really like their formula. Essie recently sent me a ton of nail colors too! I love that orange yellow color! So beautiful! Gosh the 1000'th shade already! I have never worn yellow nail polish before but there is always a first time for everything! This color looks so cool. It definitely stands out with the three coats. Thank you Liz, it really does - can see the creme effect better too. It's definitely a shade that I couldn't see myself wearing but now I've read the review, it's so pretty! I was worried about the yellow being yellow undertoned myself but being warm it helped. Wow, this colour is incredible! I'm in love with your nails too, they look great! Thank you, Sher! Sweet of you to say. I love this colour. I have been wearing lots of yellows and oranges recently. The weather makes you want to break out those summer tones. Can't believe they're on their 1000th shade! I absolutely love this shade - it's so fun and summery. It's mind blowing. They've got a collection to be proud of. It is! Should see if you could snap one up. Essie varnishes are such good quality. Love the bright yellow colour. This is such a pretty shade for summer! What a fabulous summery shade! Just perfect for days out and the sparkle will really glisten out in the light. Love the name too! It's quite an interesting colour - perfect for summer even though it's not a shade I would usually wear I bet it does look great!